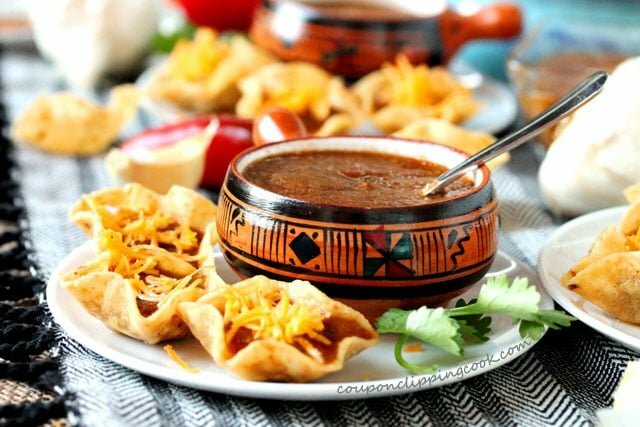 Homemade salsa is my main go-to appetizer when guests come over for dinner because it’s easy to make and always a hit. 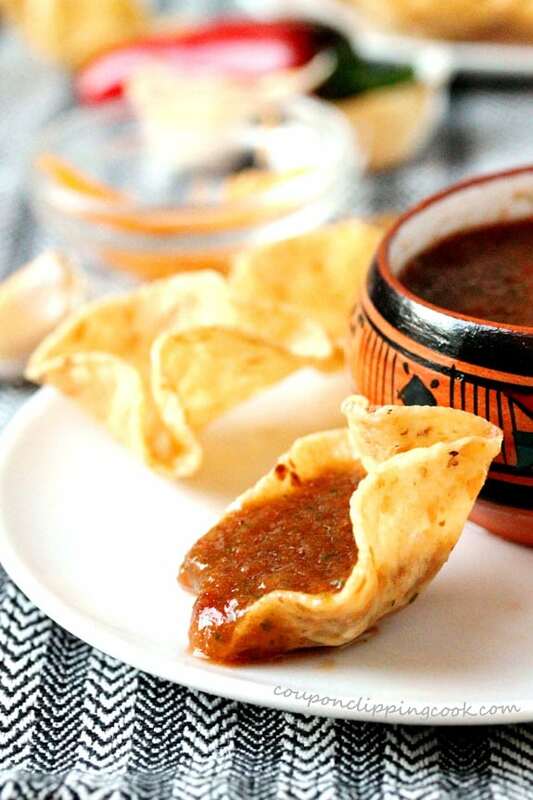 The subtle taste of roasted garlic is so good that the salsa is hard to stop eating. Which is a good thing unless the cook (me) eats it all before the guests arrive. 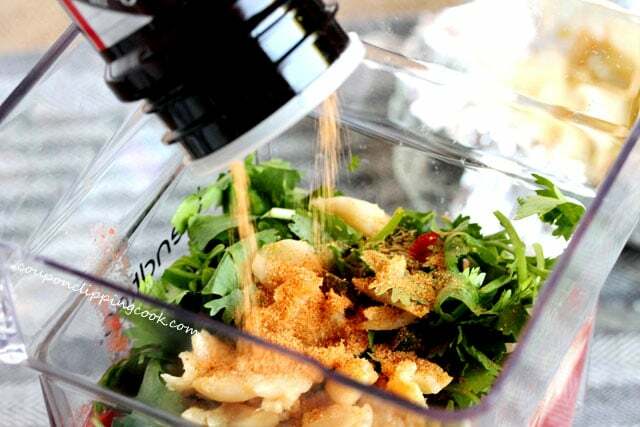 All of the ingredients go right into the blender and after a quick mix it’s done. And it can be made ahead of time too. 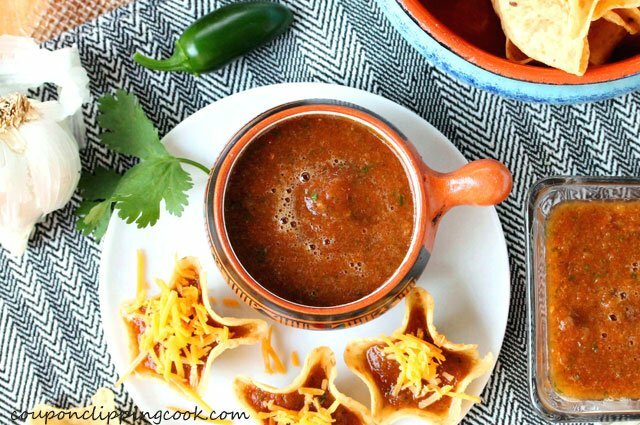 This salsa is actually better when made ahead of time and chilled in the fridge because it thickens up a bit and the flavors have time to mesh together. 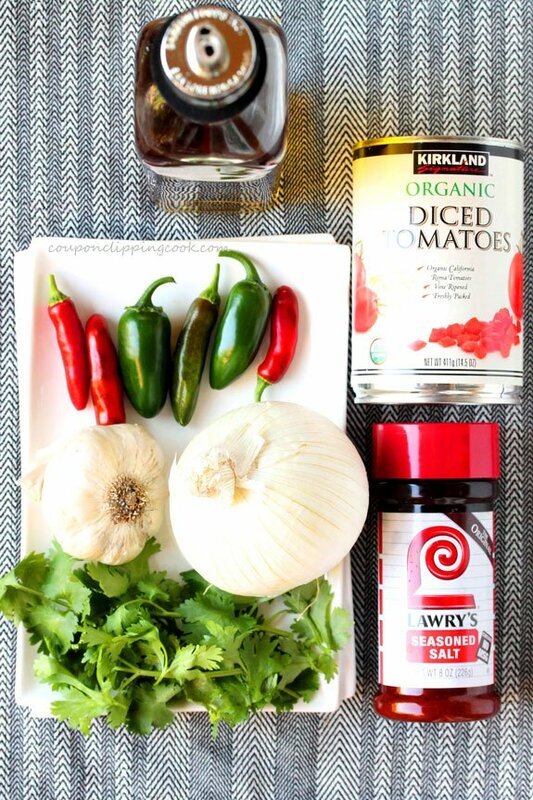 But what can make or break this salsa, is the salt. I like using seasoned salt but regular salt works just fine as long as there is enough of it added. 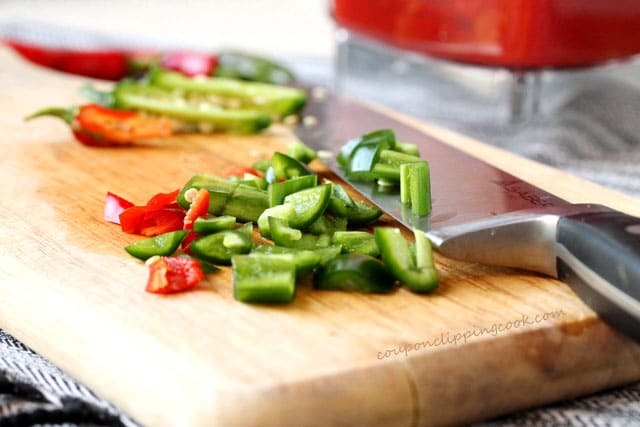 Have you ever taste-tested a recipe and thought that it needed something, then when you added just enough salt it made it taste SO much better? 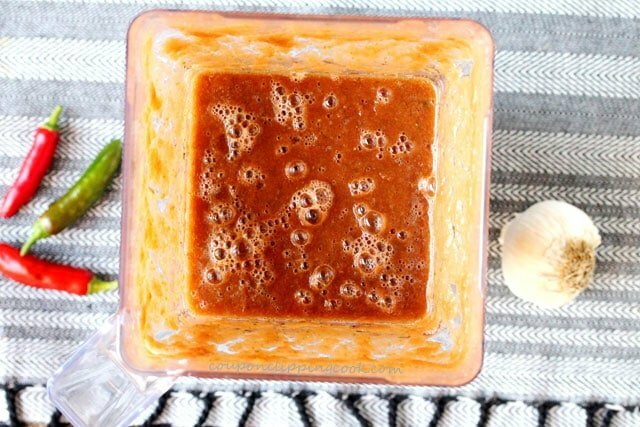 This is one of those recipes where just enough salt makes the world of difference. 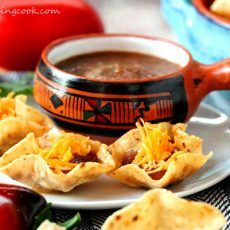 For fun, I like to serve salsa with the little-cup shaped scoop tortilla chips because they’re so pretty and something different. 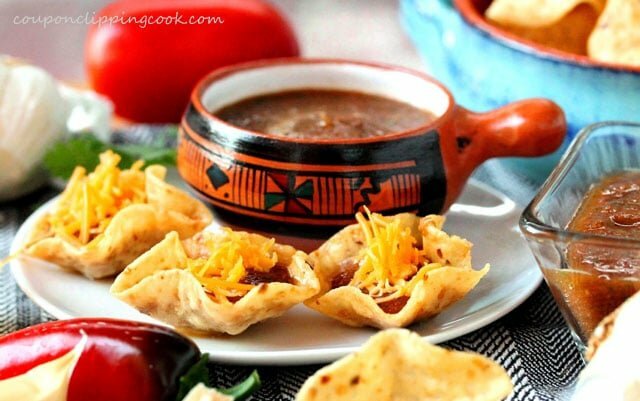 But it’s a requirement to pop the entire salsa filled scoop tortilla chip in your mouth all at once (as petitely as possible of course). 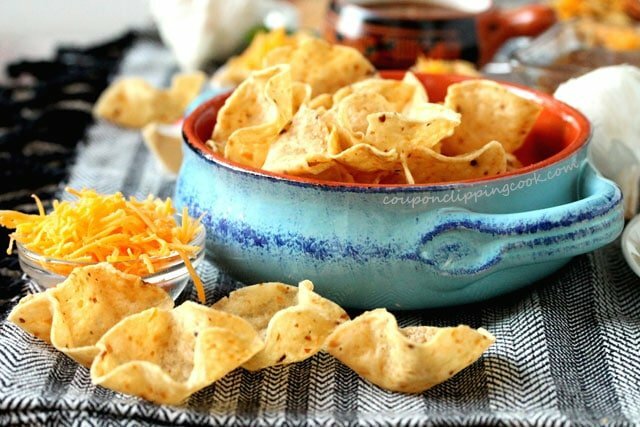 The scoop tortilla chips get soggy if filled ahead of time with salsa so they need to be dipped and filled “real-time” for ultimate yumminess. 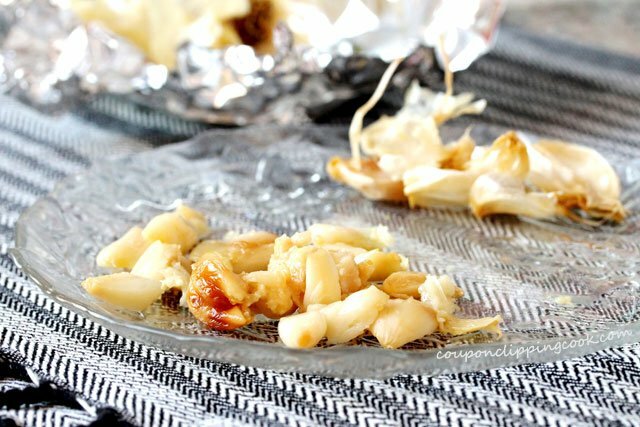 If pressed for time, instead of roasting a bulb of garlic, a couple cloves of fresh garlic can be used. 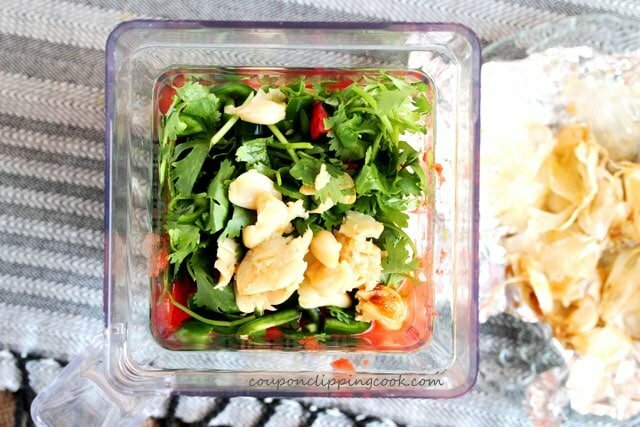 I’ll be making this tomorrow, ahead of time for Thanksgiving and I’m on taste-testing restriction so there’s enough left for the guests. 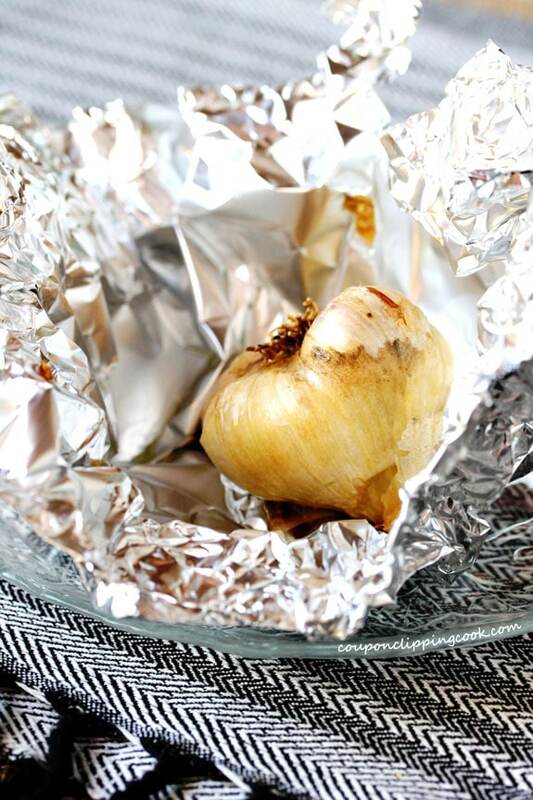 On a large piece of foil, lay the bulb of garlic. Drizzle olive oil on top of the garlic. …and squeeze them together to form a “tent”. Bake in a preheated oven for 25 minutes. 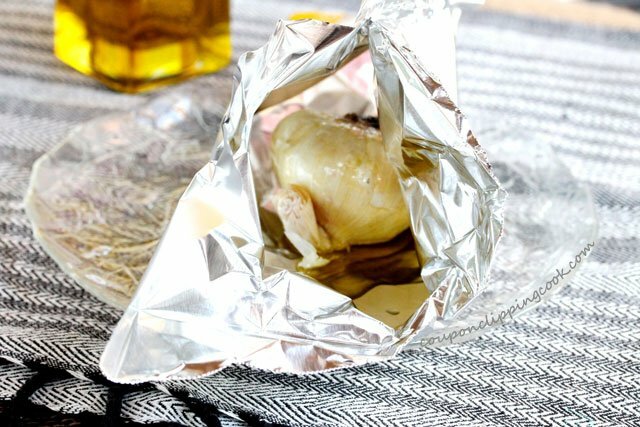 Then remove from the oven and using hot mitts, open the foil. Let cool. 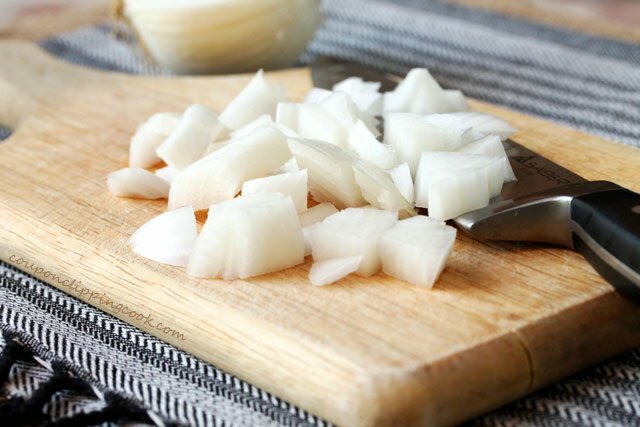 Once cooled, using the flat edge of a knife or a spoon, squeeze each garlic clove out of the skin. Set aside for a moment to cool further if needed. 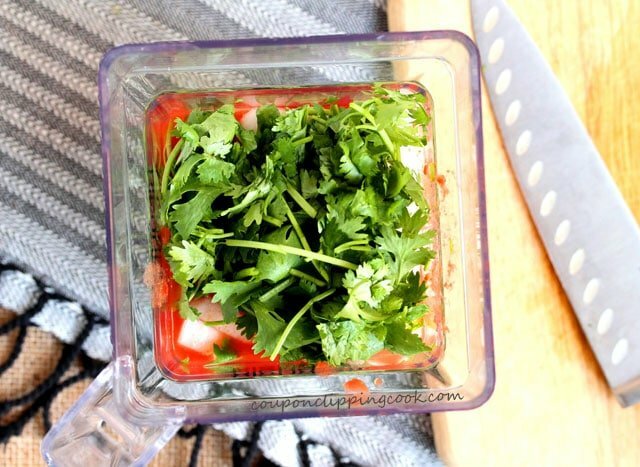 Blend on the sauce setting. 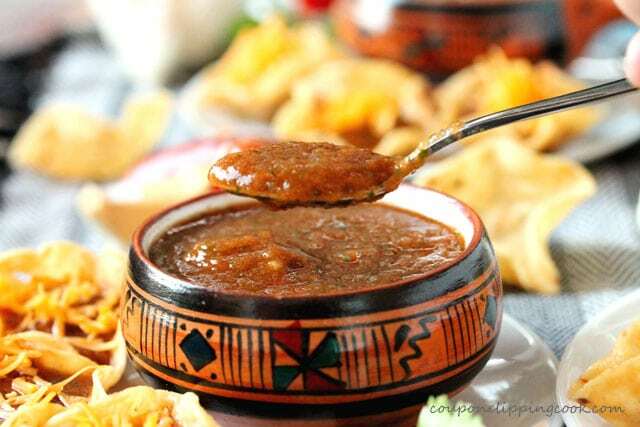 Give the salsa a taste test to see if it needs more salt. 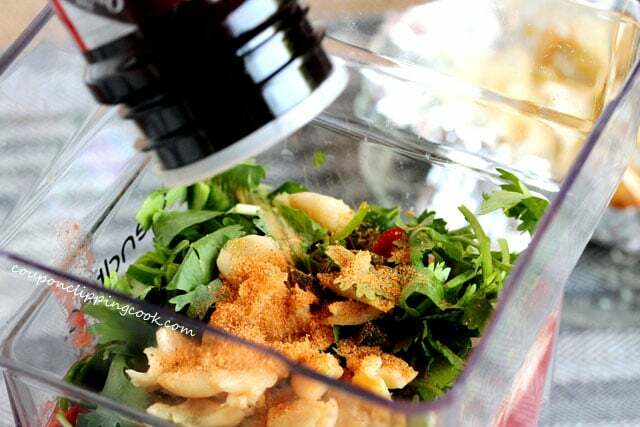 If so, add more salt and use the pulse setting to mix it in. Chill in the refrigerator before serving. 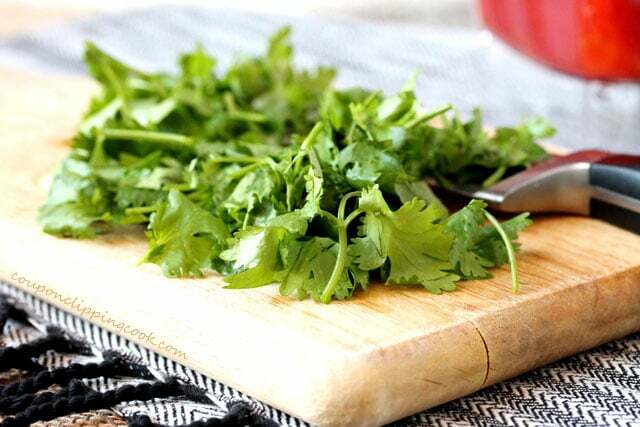 Serve with chips and as an option, garnish with shredded cheese. 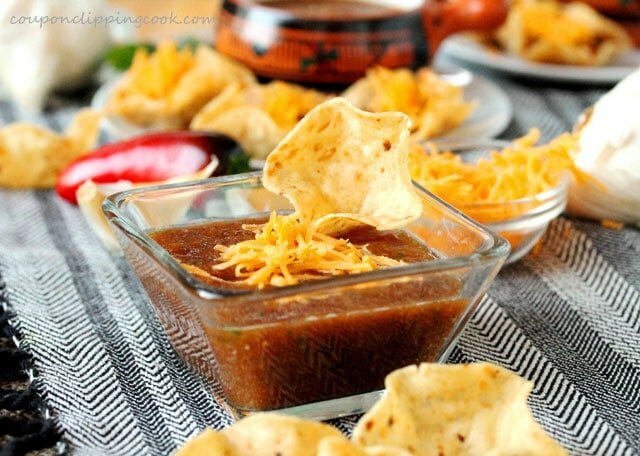 dip the chips in the salsa (or dip the salsa in the chips)…. 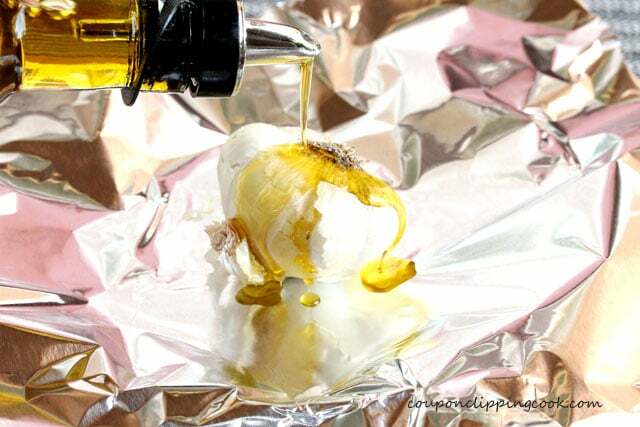 On a large piece of foil, lay the bulb of garlic. Drizzle olive oil on top of the garlic. 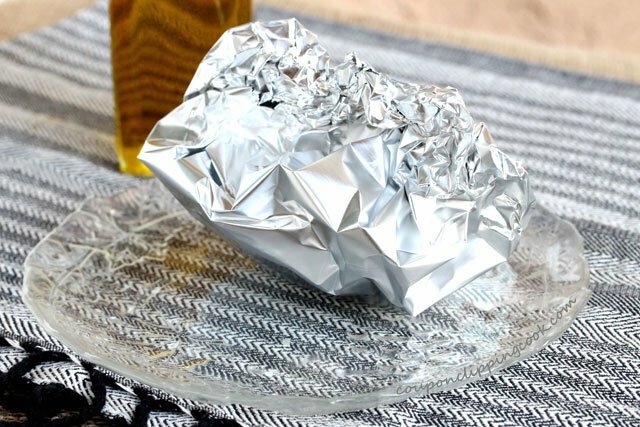 Lift up the edges of the foil and squeeze them together to form a “tent”. Bake in a preheated oven for 25 minutes. 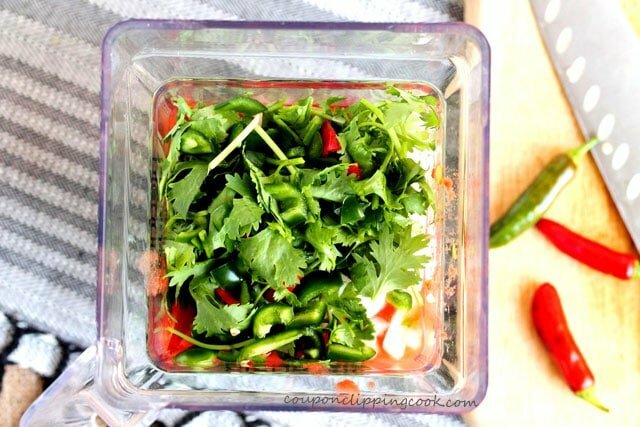 In a blender, add the cut tomatoes, onion, cilantro, jalapeno, roasted garlic and salt. 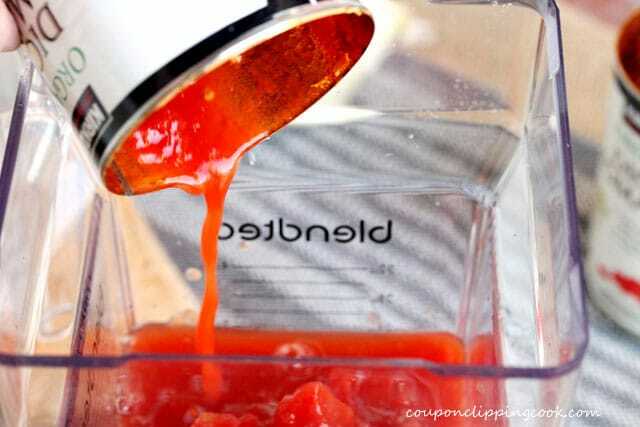 Blend on the sauce setting. Do a taste test to see if more salt is needed. 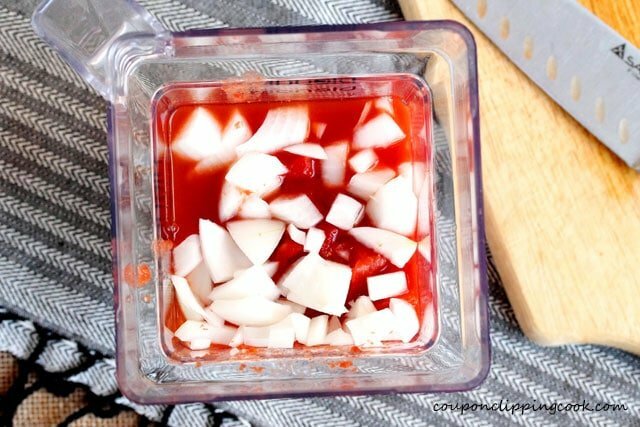 If so, add the salt and use the pulse setting to mix it in.